Moragot's Art: She's as harmless as one of those stuffed birds. She's as harmless as one of those stuffed birds. Mid September is when I usually start prepping for my very favorite holiday of the year. Halloween. Why? Well, it's when you start seeing decorations go up, people start thinking about costumes, and even all the Haunt Events at amusement parks are up and running. So I started off my month and a half celebration of the horror with a classic. Hitchcock's Psycho. 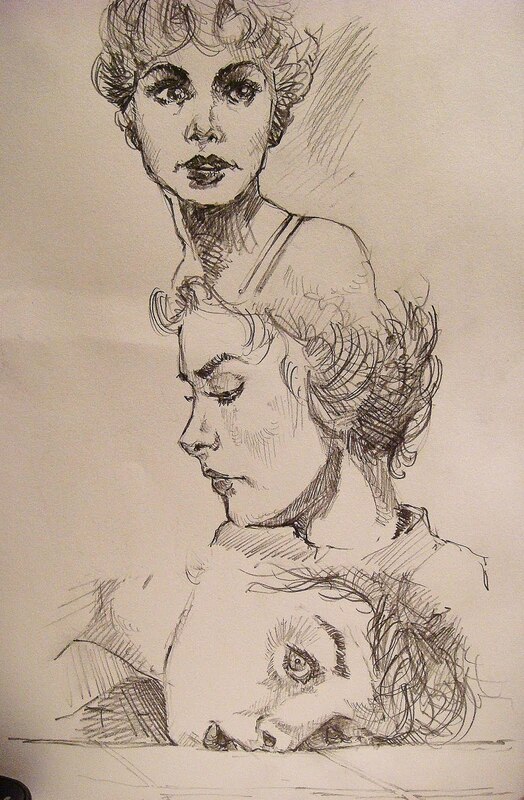 While watching it I took some time to do some quick face studies of Marion Crane (Janet Leigh). Not only is she very beautiful (and without sounding too much like Norman Bates ... fun to draw), but she's always associated with the genre. Whether or not you've seen the movie, seeing a black and white photo of her in the shower will take your mind straight to horror. 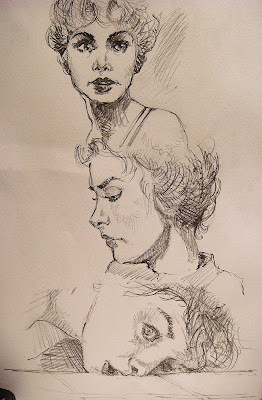 wonderful sketches. I also loved your animation , especially the Indiana Jones piece.